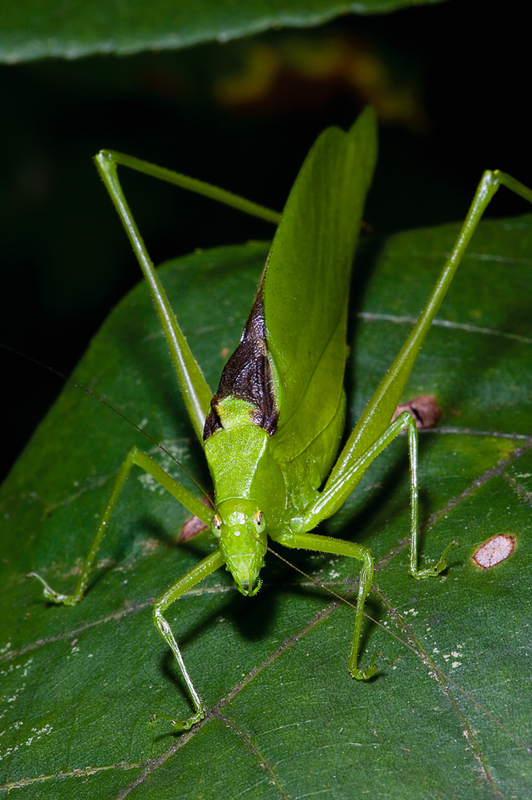 Song of a Oblong-winged Katydid (scroll down for explanation and additional recordings!). The largest member of its genus, the Oblong-winged Katydid can be recognized by its very dark stridulatory field and wings that extend farther back from the body than on other amblycoryphids. Oblong-winged Katydids are powerful fliers and can easily escape a collector. They prefer open weedy habitats with tall vegetation, where they perch near the top of plants to sing. They also like apple orchards. Song: A brief, two-parted zeee-dik! at around 9 kHz, given every few seconds. 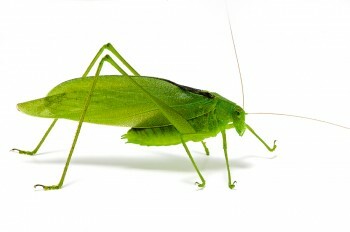 This unique song is easily distinguished from the songs of all other katydids. Very rarely, pink or yellow individuals may be found within dense populations. Sonogram of a Oblong-winged Katydid. © Wil Hershberger.